Our By-Product Separator BPS reduces the accumulation of by-products in vulcanizing equipment. It keeps the line capacity at a high level with high cooling efficiency and minimized cleaning downtime. The separator is installed to the gas circulation piping rather near the splice box, so that gas can be led at a hot temperature into the separator. The by-product separator consists of a water cooled heat exchanger with the necessary valves and accessories. 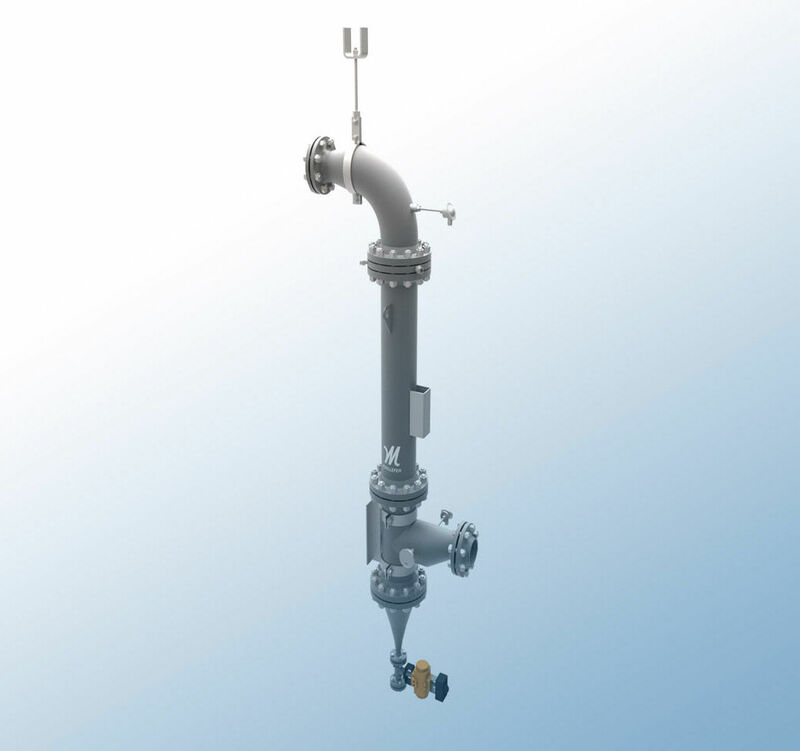 The gas flow, which is based on natural convection, is adjusted with a regulating valve so that the gas temperature will be between 50 to 70 °C in the separator. By-products are drained out from the separator through a timer-controlled valve. The by-product separator is installed in a vertical position to the gas circulation piping near the splice box. The inlet gas temperature should be around 200 °C, which is why the gas circulation before the by-product separator is insulated. The cooling unit in the centre of the equipment can be disconnected for cleaning when necessary, in order to keep the equipment as effective as possible. The by-product cyclone is a component that is installed in all polluted nitrogen exhaust pipelines that lead from the by-product separator or pockets to the atmosphere. The by-product cyclone has the ability to separate the by-product from dirty nitrogen gas. The by-product is further led to the by-product collecting tank, and clean gas is led to the atmosphere. In addition, the delivery consists of a dam pipe, which is installed in front of the cyclone to reduce pressure shock, and a hand operated ball valve for safety purposes. The nitrogen reheater is used in gravitational gas circulation of the by-product separator. There is gas temperature loss in the by-product separator, after which the gas is reheated by the nitrogen reheater before the gas is supplied back into the CV tube, and the gas temperature in the heating section remains the same as before the separator. The nitrogen reheating system consists of a reheater body with a resistor, piping with its parts, a flexible hose and all necessary valves and instruments. Water inlet / outlet connection R 1/2"